Since there are so many little interesting tidbits today, this post is going to be more a stream of consciousness than my normal writing. 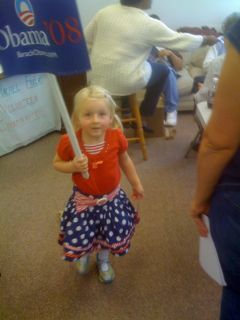 • Arrived in Ashburn to find 40+ volunteers ready to hit the sidewalks – 90+% of them were from out of state. My canvassing team is 3 people, so we take on some big packets. These are clustered so one can coordinate and drive while the other 2 zip down a street, but even though I’m the driver I get out to do a fair amount of knocking myself. • On my 2nd house, a woman actually trips down the stairs coming to the door! I see it happen through the clear storm door and open it to help, but her husband comes and helps her up. Luckily, she’s not hurt. Rough start to the day! • I see some McCain canvassers for the first time, driving by and I consider how little presence the McCain campaign has here even though we’re still seeing the dueling yard-signs everywhere. 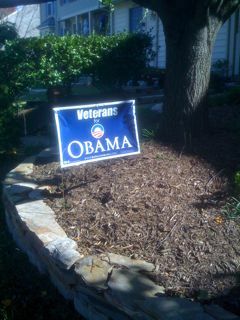 “Veterans for Obama” seems so powerful since McCain’s war “hero” status is supposed to gain him the military vote (and Virginia has a long military tradition). • We encounter two young women canvassing for Judy Feder, local Democratic candidate for Congress. We’re amazed to find out they are Columbia University students, part of a group of 130 who came down from NYC to knock on doors for Democrats. • I actually talk to an undecided young voter (he’s 25). The most interesting thing he said was that I was probably the 4th Obama supporter who’s visited him vs. zero McCain supporters. Before coming to VA, I’d heard that northern VA was full of minorities who’d moved out to the suburbs from DC. This afternoon, we found these fascinating “pockets” – mini neighborhoods of a 1-2 dozen houses that were all Asian last names. This is common in CA but I wasn’t expecting it here. I tried to go for the East Asian houses and it was interesting to note that the Columbia students had assigned a young Indian-American to cover the neighborhood that was literally 75+% Indian. The one “negative” part of the day was getting into an argument with an elderly woman who’d already voted for McCain. She wouldn’t leave us alone and got progressively nastier, crossing the line when she told one of my partners that he must not love his 3 kids if he’s supporting Obama. This is an extreme case, but one can connect a campaign’s attitude to the attitude of its supporters. As with McCain/Palin, this woman had nothing positive to say, not even anything good to say about her candidate – just nasty attacks. Ending tally for the day – approx 170 doors knocked. Enough useful conversations to feel successful. Back at it again tomorrow! Thanks for the great insight! It’s really interesting to read about the environment there and the coordination of volunteer efforts. Good luck making change keep up the good work.